If you feel like sending your tastebuds on a tropical vacation, you can. Just make these. And they’re perfect for Cinco de Mayo, too. I went 5 years of blogging with only a couple lime recipes, but in the last month this is my third one. I had a surplus of limes after (over) buying them for margaritas. I could throw a frat party and not run out of limes and margaritas, so rather than continuing to drink them, I baked with them. 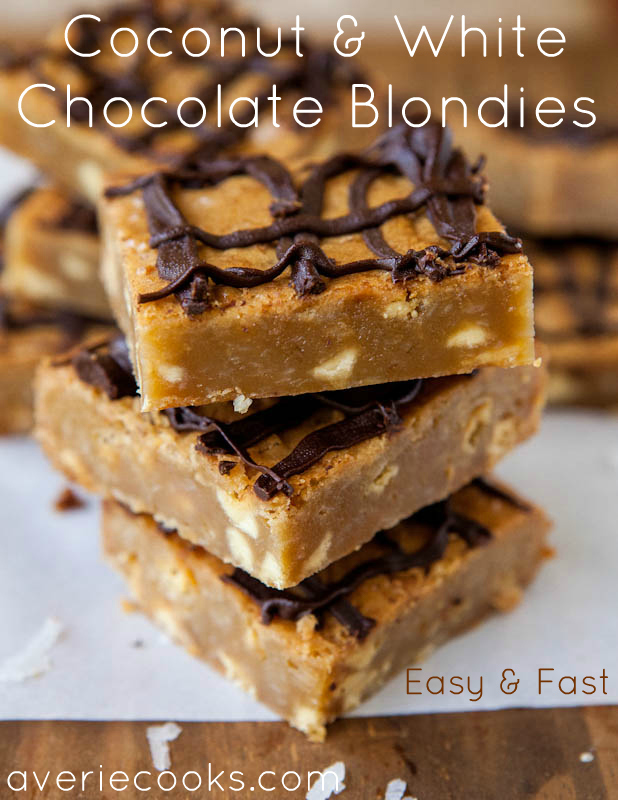 The bars loosely follow my trusty blondies recipe that I’ve used in at least 20+ adaptations. I love the base recipe because the batter comes together in one bowl, without a mixer, in 5 minutes. Simply melt butter in the micro, add brown sugar, an egg, lime juice, lime zest, and vanilla. Stir in shredded coconut, flour, white chocolate chips, and bake. Super easy. 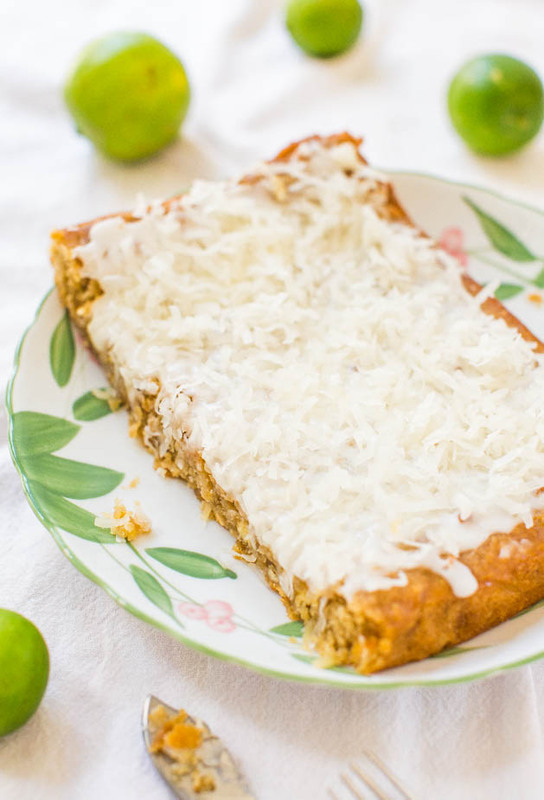 I glazed the bars with a simple confectioners’ sugar and lime juice glaze, and then topped with coconut. The glaze seeps into the bars and makes them even moister. The extra bit of lime juice in the glaze really boosts the overall lime flavor, which is pleasantly bold and tart. When it comes to lime or lemon bars, I prefer a prominent zing to muted and subtle. And by using both lime juice and zest in the batter, and with the lime glaze, there’s plenty of lime pop. The bars are super soft with ample texture from the coconut and white chocolate chips. They’re dense, rich, and not cakey or crumbly. 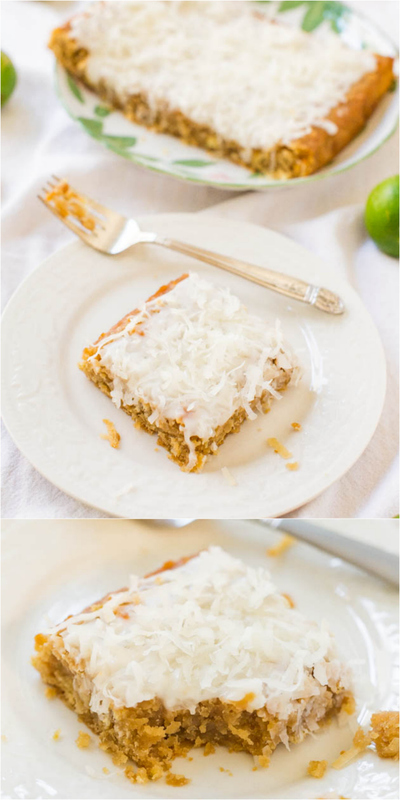 The shredded coconut adds texture and a smooth tropical flavor, without being overdone. Coconut can easily dominate a flavor profile, but it’s nicely balanced. I love white chocolate and while I’m in Aruba I have a tendency to bake with it. I made these recently while I was there on a tropical vacation and they were perfectly fitting for the surroundings. Seeing these images again makes me want to jump on a flight right back there. There’s something about the flavor combo of lime and coconut that just makes me crave beach parties, warm weather, and letting the good times roll. Throw in a little white chocolate and some sweet-and-tangy glaze, and I’m totally set. If you feel like sending your tastebuds on a tropical vacation, you can with these easy, one bowl, no mixer bars. 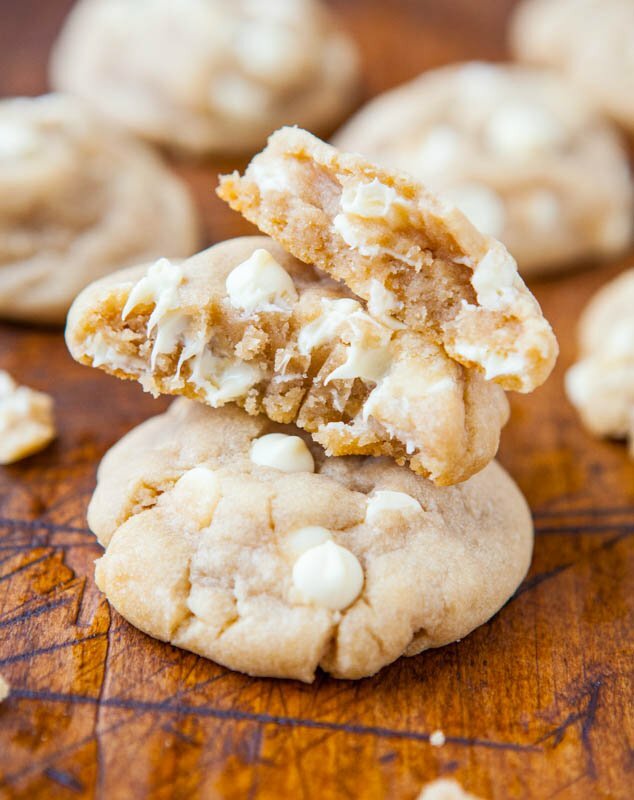 They’re super soft with ample texture from the coconut and white chocolate chips. By using both lime juice and zest, the bars have a nice limey pop and are bold but pleasantly tart. 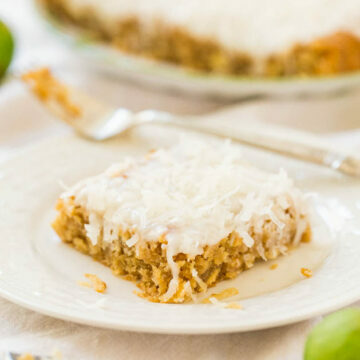 The shredded coconut adds texture and a smooth tropical flavor, without being overdone, and white chocolate is tailor-made for the lime-coconut flavor pairing. The lime glaze enhances the overall lime flavor profile and as it soaks in, makes the already super soft bars even more moist. Bars – In a large, microwave-safe bowl melt the butter, about 1 minute on high power. Wait momentarily before adding the egg so you don’t scramble it. Add the egg, brown sugar, lime juice (I used closer to 1/3 cup), lime zest, vanilla, and whisk until combined. Add the white chocolate chips and stir to combine. Bake for about 30 minutes, or until a toothpick inserted in the center comes out mostly clean, or with a few moist crumbs, but no batter. Allow bars to cool in pan for about 30 minutes before glazing. Lime Glaze – In a medium bowl, add 1 cup confectioners’ sugar, 2 tablespoons lime juice, and whisk until smooth. As necessary, add additional lime juice (or sugar) to reach desired glaze consistency. Glaze should be fairly thin and easily pourable over the bars. Evenly pour glaze over bars, smoothing it lightly with a spatula as necessary. Evenly sprinkle about 1 cup coconut over the top before slicing and serving. Bars will keep airtight at room temperature for up to 1 week, or in the freezer for up to 6 months. 5-Calorie Raspberry Lime Margarita Fizz (non-alcoholic, vegan, gluten-free) – 5-Calorie Raspberry Lime Margarita Fizz (non-alcoholic) – Cool, refreshing & won’t break your caloric bank with only 5 calories! A taste of the tropics! These bars look fantastic. I also prefer a strong citrus zing. Love the combination of white chocolate and coconut. Yes to tropical vacations!!!!! My imagination has gone into overdrive. That is what happens when you read a food blog right before lunch. Sigh. Wonderful combo of ingredients. Now let’s talk about all those limes and margarita makings you have laying around your house. What did you say your address is? Averie, I’ve just come to love the taste of lime and coconut recently. I don’t know where I’ve been… I must get out more, maybe! But, I am loving how you created these decadent bars! Love your tropical twist on these bars! This sounds right up my alley. 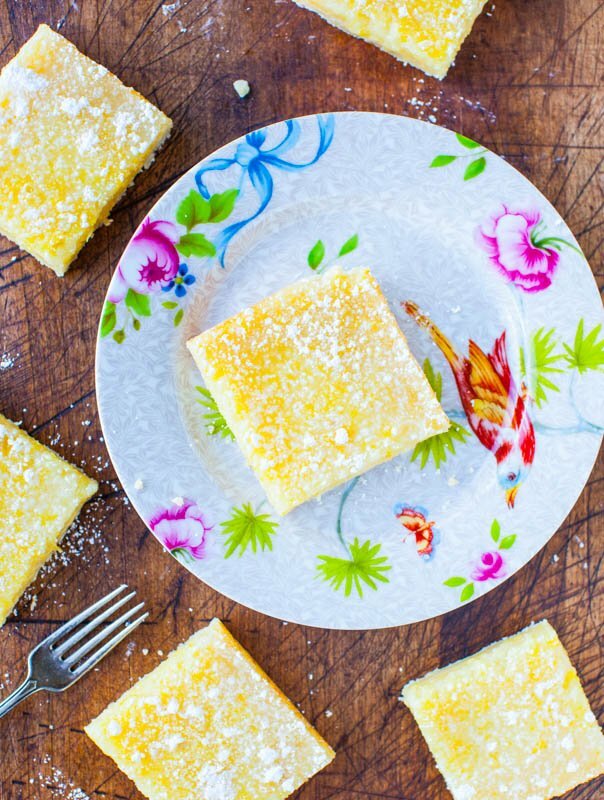 I’m a big citrus fan, and it pairs so beautifully with coconut and white chocolate. Yay! Pinned and planning on making it this summer! Averie I’m loving the lime recipes! I could totally eat a pan of these bars with a pitcher of your all natural margaritas! 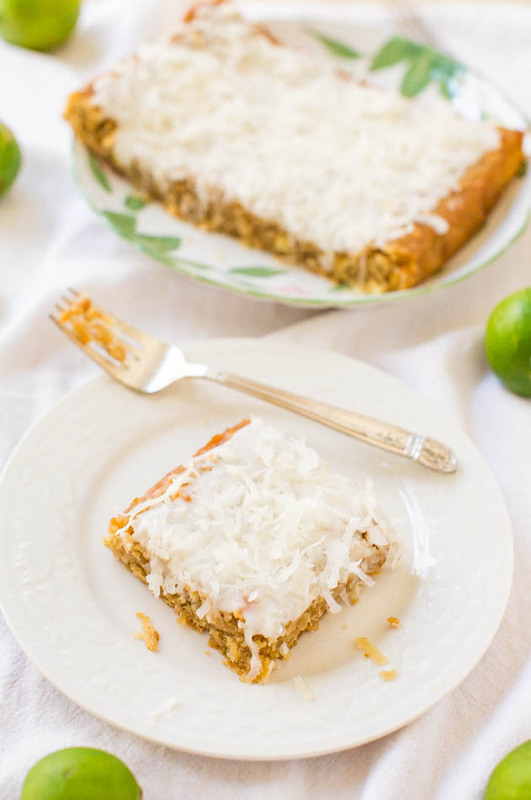 And while I’m at it I might as well have a few of your key lime bars too! Glad you like all the lime recipes! 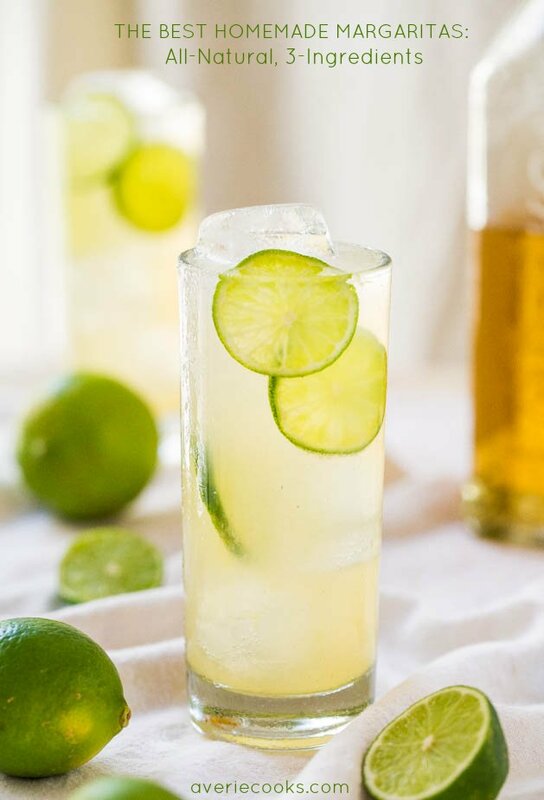 I’m totally loving your lime recipe kick! 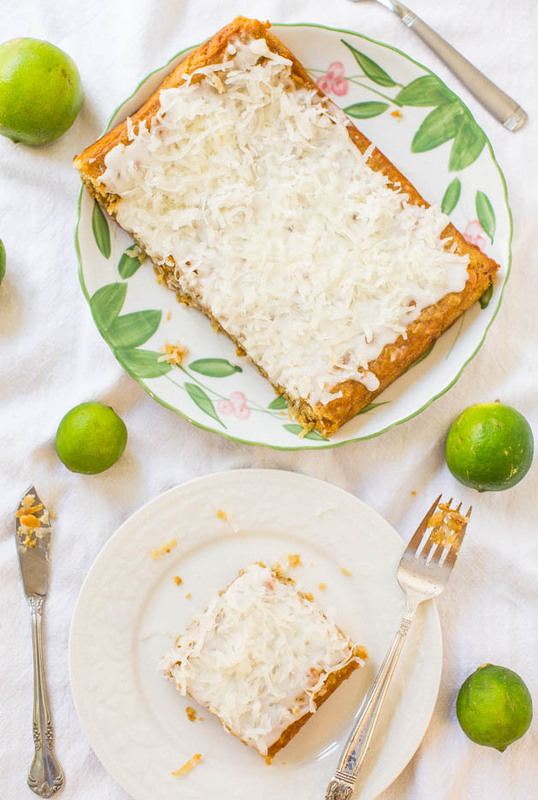 I tend to think of lemons and oranges when it comes to citrus, but rarely lime… The pairing with white chocolate and coconut sounds so tropical and absolutely irresistible! And your plates are so pretty. Where do you find them all?? I wish plates were that cheap here! I need to go thrift store shopping more often, but there just aren’t very many where I live. Aka, umm, 1 that I know of. That’s what I get for living in a college town; everything is dominated by Target and Walmart instead! 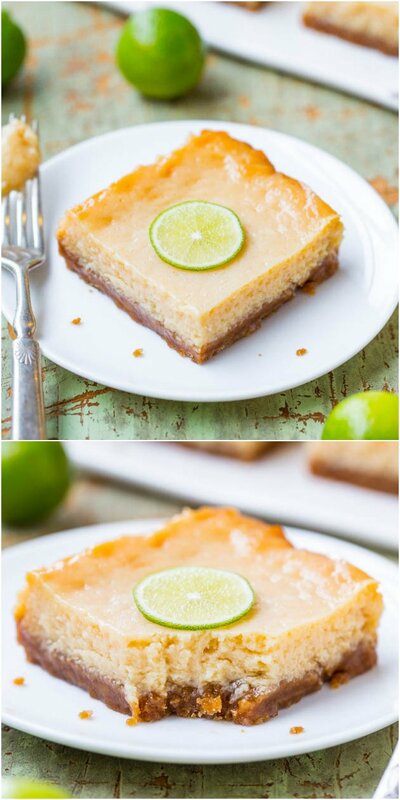 I really thought that slab in the first picture was one serving … don’t burst my bubble and tell me otherwise :) I am loving this white chocolate/citrus combo! I need to try it asap. Love the coconut, too! Three of my favorites all in one bar! I’ll take one of these with one of those margaritas you shared the other day. What a great recipe. I’m totally digging these bars. Pinned! Wow, these look amazing! I love anything with coconut! Love these photos – so pretty! And love this combo too! These bars look incredible! 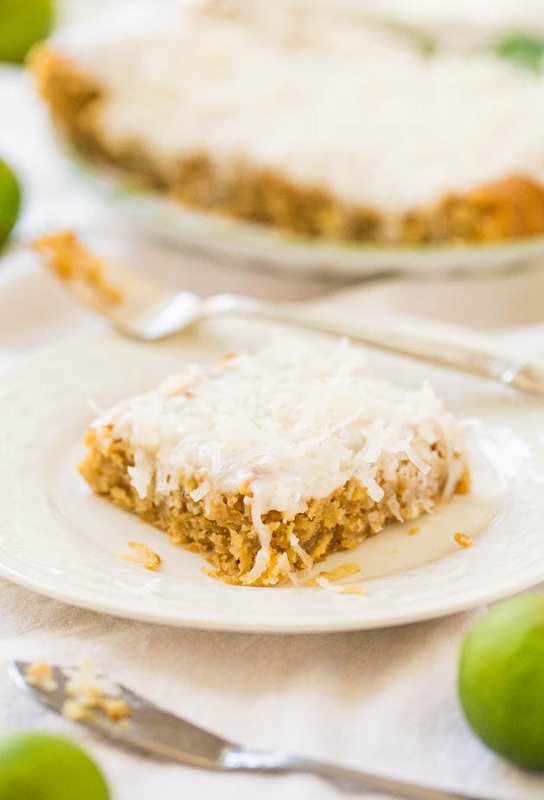 I am totally obsessed with coconut and love lime anything so this combo sounds perfect to me! 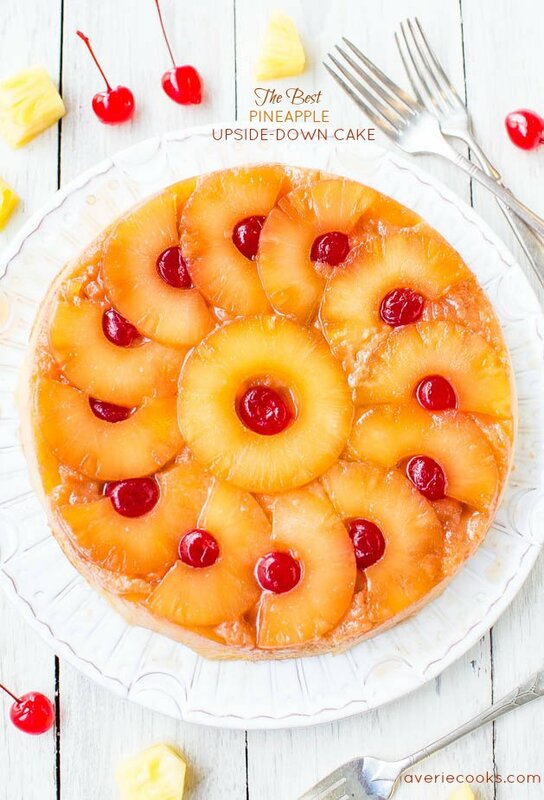 I can’t wait to try it – thanks for sharing another stellar recipe Averie :) Pinned! These look so summery and luscious, Averie! I’d love to bake up a batch for my upcoming BBQ! I love that you get to go to Aruba and make amazing desserts like this. 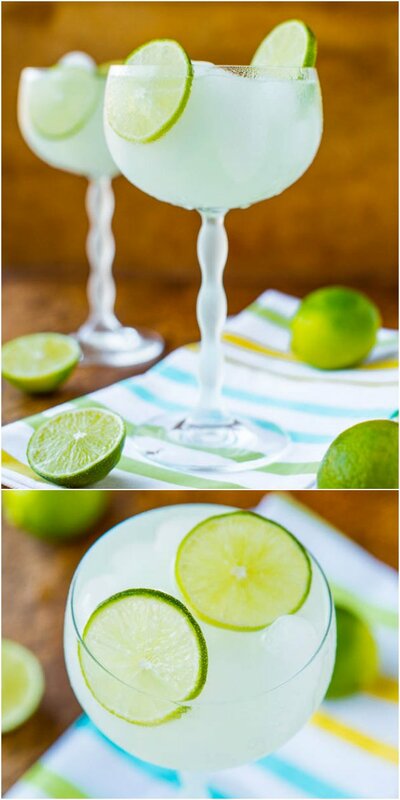 Keep the lime recipes coming – I love them! Seriously where is everyone finding these limes?! It’s like GA is the only State with a shortage or something! Rock hard and $1.50 each! It’s practically a crime…. 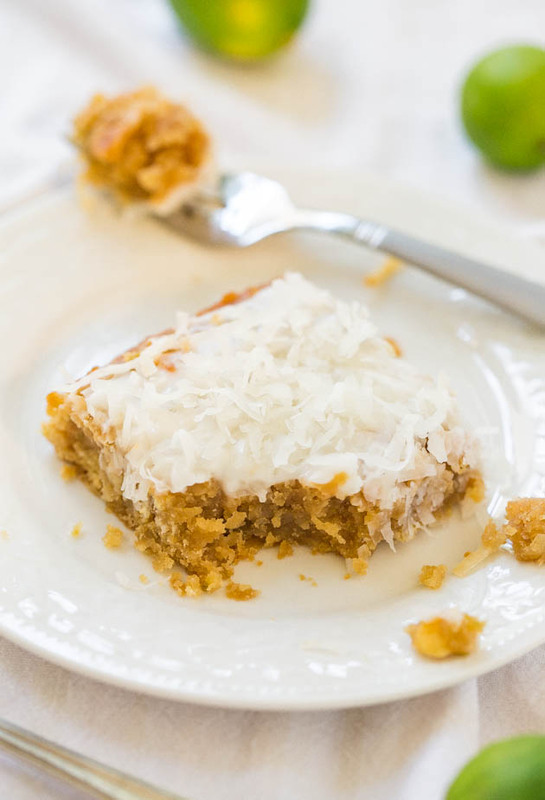 Especially when you post something as delicious as coconut lime bars…it’s just too cruel! These looks delicious and as soon as I get my hands on some limes that cost a small fortune, I’ll be making it!! ps- I posted your cream cheese chocolate chip cookie recipe today. I hope you got the link back but sometimes it doesn’t work. silly internet. Anyways, they were TO DIE FOR. I now want to put cream cheese in everything! Never got that ping but off to see it now :) Glad you loved them! And others have written about these pricey limes. Mine are 49 cents each at TJs and sometimes I can get 3 for a buck at the reg. groc store. If they are more than that, I wouldn’t buy them! $1.50 each for non-juicy limes sounds like highway robbery! ugh! I’m loving all of these lime recipes from you! Especially this one. Coconut, lime, and white chocolate are divine together!! :) Pinned! I made these last week, they were AMAZING – so easy to make and very zingy, thanks! I’m so glad to hear that you loved them! Zingy indeed :) Thanks for trying the recipe! Wow!, looks very delicious, making me feel hungry. Surely, it’s delicious with my all-time favorite “shredded coconut” ingredient on it! 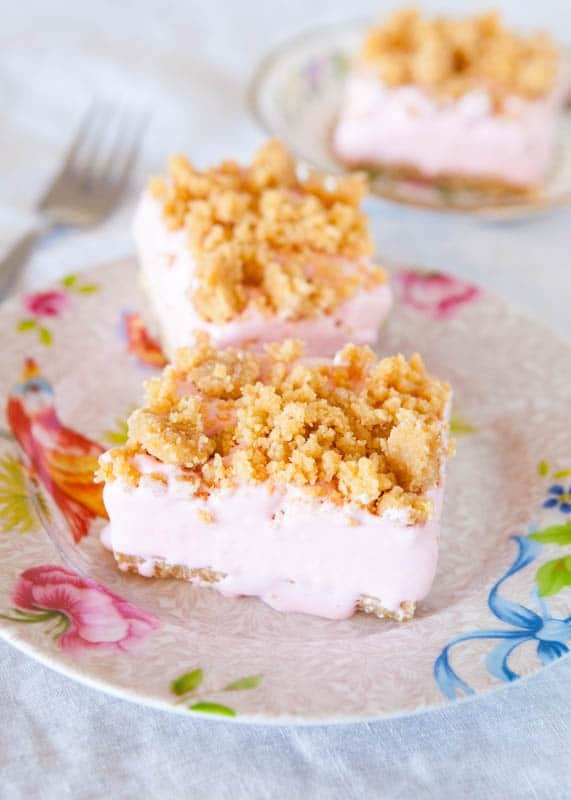 I love your desserts and I am going to give this one a try! Do you think I can double the recipe and bake it in a 9 x 13 pan? Probably would be fine, although I haven’t personally tried doubling in a 9×13 pan so can’t speak from personal experience.